Yesterday was the last day my sister Janice could be here in Florida for a while… and it was also the day our nephew Wayne arrived from Memphis. Usually at meal times we try to eat with Dad in the dining room but on this night we decided there was cause for celebration and so we called Napoli Ristorante and Pizzeria to order a pizza. 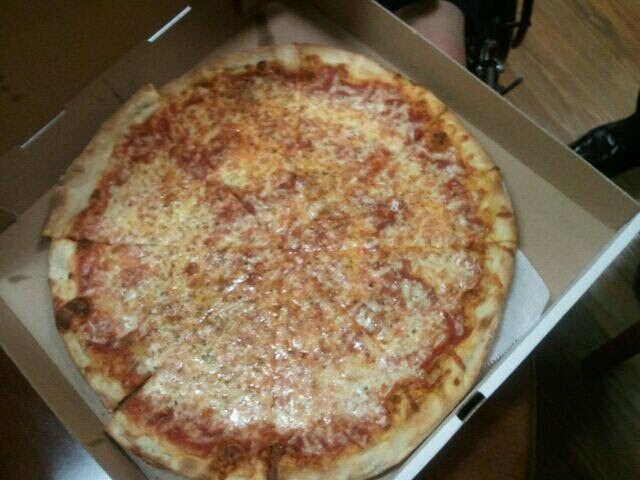 We discovered that there was a special on Tuesdays and so instead of getting one pizza, I ordered an extra one for the nurses who have been caring for my Dad in rehab. It seems that bringing food (which I view as showing a little love) to those who care for our loved ones is a nice thing to do because sometimes those people (who work 12 hour shifts) don’t have the chance to take care of themselves properly. Hey, just because this blog is about pies it doesn’t mean that I have to make every one… I just have to give them away! Dad enjoyed the little bit of pizza he ate and we were able to spend time together as a family almost oblivious to the reason that brought us all together. It was a good moment in an otherwise very stressful time. 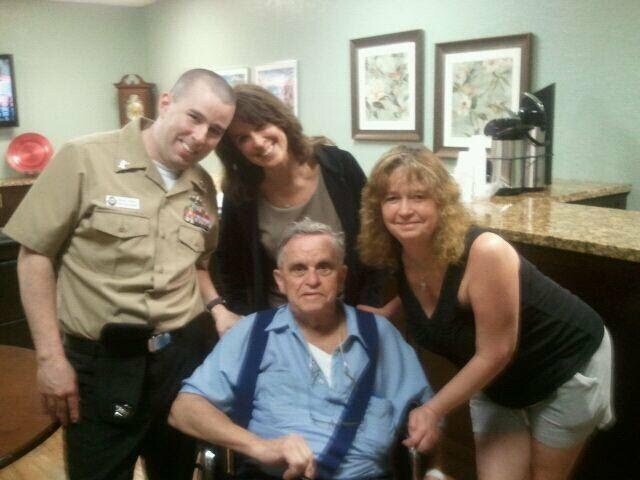 In fact, while Dad doesn’t look “great” in this photo, Janice and I both know how far his recovery has progressed. Just last week he was lying in a hospital bed eating what they lovingly refer to as a “soft, mechanical” diet and yesterday he was sitting up in a wheel chair making jokes and eating pizza. We have come a long way and I am thrilled! One last thing I’d like to share is this phone call I had with Alaska Airlines agent Jan in Boise. I wanted to extend my visit here so that I could be present for the surgery that my Dad was scheduled to have this next week (my original ticket had me leaving yesterday morning). When I dialed the number for Alaska and told Jan what I needed to do and why she listened, took the information, and found me a return ticket for next week. Then she told me that the change in fare was $58 and there was also a $100 change fee. I asked how to appeal the change fee given the circumstances and then said, “Never mind. I’ll worry about that when I have more time.” Jan asked me to hold a moment and a few minutes later came back on the line and told me that she had asked her supervisor and could waive the change fee for me. I was truly amazed and deeply touched that she did this on her own; in a time like this, every act of kindness is so powerful and appreciated more than you will know. So, to Jan in Boise I would like to send a virtual pie for her assistance and her compassion – Alaska Airlines is lucky to have you! I’m glad to see this picture..Your Dad looks good and while I know he has some challenges to overcome I am sure that with his determination and sense of humor that he will get better and better..Please tell him that we all are praying for his return to normal. (.which as we all know is questionable for him..:) ) here..and that his NY family is thinking about him! Ahhh, it’s good to see such a great group photo and hear how much your dad has progressed in just one week. I’m sure having family surrounding him has helped immensely! What a great group photo! And I agree that your Dad looks really good. Prayers for the scheduled surgery. As for Alaska Airlines, I’ve had a similar experience and really appreciate the human quality of such a huge corporation which does come down to the person on the phone with you — one on one. Blessings for your family and all who are caring for your Dad in rehab and beyond!